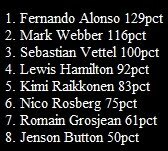 As you may know, in December last year, Alonso won votes from twelve F1 Teams as been the best driver of the 2010 season in Autosport magazine. I don't know if those formula 1 teams are just irritated of RBR strategies or RBR chassis..or RBR drivers, but i know that a great driver is fantastic when is riding like nobody his car on a track, but also when he find the best set up of the car together with the team for one or other cirucuit. 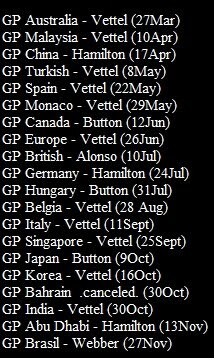 Is clearly that Vettel asumed a lot of risks durring the 2010 championship setting up his car to the limit, driving like a ''crazy'' and some times it cost him the race. 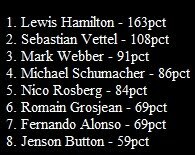 Anyway crazy of the year goes to Hamilton. 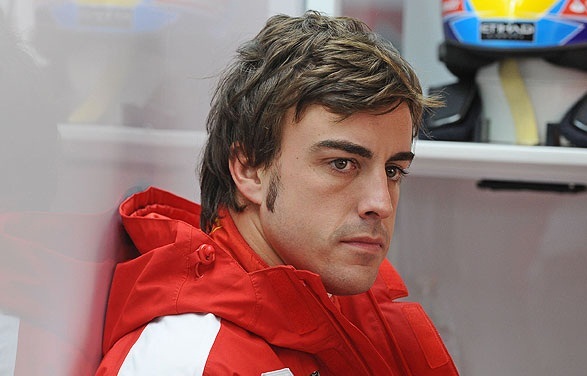 Now i don't say that Alonso isn't a great driver(we saw a lot of take outs achieved in 2010 by Fernando), even i don't say is antipathetic(antipathetic was De La Rosa with his statements about his Sauber-someone feeds you and you talk bad about the team ?! ?, or Rosberg with his photo's from his official site :) seems more like La saga Crepusculo actor). 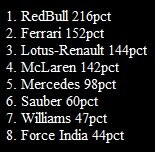 Anyway at that poll from Autosport magazine, Vettel was a close second after Fernando Alonso, while Nico Hulkenberg was the only rookie in the top ten.